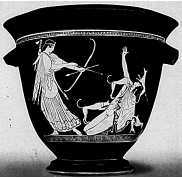 An ancient Greek pot depicting the death of Actaeon. If you know more information about the source of this pot, please let me know. Read more about Artemis and Actaeon.